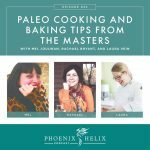 Today, we’re talking about the intersection of religious traditions and the paleo autoimmune protocol. Many traditions – both sacred and secular – center around food. In addition, religions sometimes have specific rules concerning diet. When you’re diagnosed with autoimmune disease and change your diet to support your health, how do you maintain your connection to your religion, your culture, and your community? 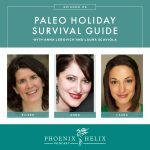 To answer that question, I’ll be interviewing 3 guests from 3 different faiths about how they mindfully balance their traditions with their diet and health needs. 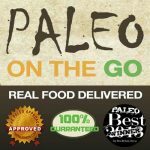 An online store, where everything sold is compliant with the elimination-phase of the Paleo Autoimmune Protocol. They sell a wide variety of products, including protein bars, AIP-friendly spice blends, cooking and baking ingredients, snacks, non-toxic skincare, and more. This week, they're having a sale: 20% off baking supplies. The sale ends 5/15/18. Within the contiguous United States, get free shipping for all orders over $49. Themed product bundles are discounted 5 percent. Subscribe and save 10% to any product or bundle. You choose delivery once every month, every 2 months, or every 3 months. If you're a first-time customer, use the code PHOENIX for 10% off your order. Purchase here. Tami has been open with her synagogue community about her dietary needs, and they've been very supportive. Members have even prepared AIP meals for her when she was sick and also after the birth of her daughter. 5 years ago, she was unique in her community, but now many members eat gluten-free dairy-free diets, and some have also done the Whole 30. In Judaism, you're supposed to have a healthy mind, spirit and body, so a healing diet fits very well with her faith. Foods that cause inflammation for Tami, she considers not kosher for her. The tradition she found easiest to adapt was Shabbat. Shabbat is the Jewish day of rest, with a focus on family. Both of those things naturally support Tami's autoimmune health. She makes roast chicken and vegetables with a salad for Friday night dinner, which is a common Shabbat meal. And she saves the leftover bones from the chicken to make bone broth, saving her money as well. She drinks grape juice instead of wine during the blessing, and finds that to be an easy trade. She does, however, miss the traditional challah bread and hasn't found a good AIP replacement for that. They go to their synagogue to celebrate Shabbat on Saturday, and that's when she and her children miss traditional foods the most. However, their synagogue is very supportive, and there is usually plenty of food they can enjoy. Above all, they enjoy spending the morning with their faith community. For Jewish holy days, she does her best to make simple adaptations in the spirit of the celebration. For Hanukkah, celebrating the miracle of the oil is the most important part of the tradition, and she makes sweet potato latkes fried in extra-virgin olive oil. For Succoth, she makes stuffed acorn squash. For Rosh Hashanah, she adapted an AIP biscuit recipe to make a round bread. For Passover Seder, she went to a family potluck. She was able to preview the menu in advance to see what she and her children could and couldn't eat, and then brought some carob truffles to share for dessert. For Purim, her family loves dressing up in their costumes, and she makes AIP Hamantaschen as treats for her children, substituting tigernut flour for the almond flour in the recipe. Tami loves being able to carry on her family's tradition of baking with her own children. Her mother is also very supportive, and has made her a plantain kugel. Lastly, homemade tigernut butter reminds Tami of a favorite childhood treat: halvah. The tradition she found hardest to adapt was Shavuot, since it's a dairy-focused holiday. Traditional foods served at her synagogue's celebration include cheese blintzes, pizza and ice cream. This year, though, they started serving coconut ice cream as one of the options, because the rabbi's children have some health issues and are now also dairy-free. Tami made AIP-friendly lemon “cheesecake” bites to share as well. The most difficult food challenge for Tami personally has been giving up nightshades. She grew up in an Israeli family, and they were a staple in her diet. She does make nomato sauce and uses it in a wide variety of meals, but she especially misses shakshuka. Healing is about so much more than food, and Tami's faith supports her health in many ways. Every morning, she sings the Modeh Ani prayer to her children. Whether she's experiencing an autoimmune flare or feeling great, she begins each day feeling gratitude, joy, strength, and hope. 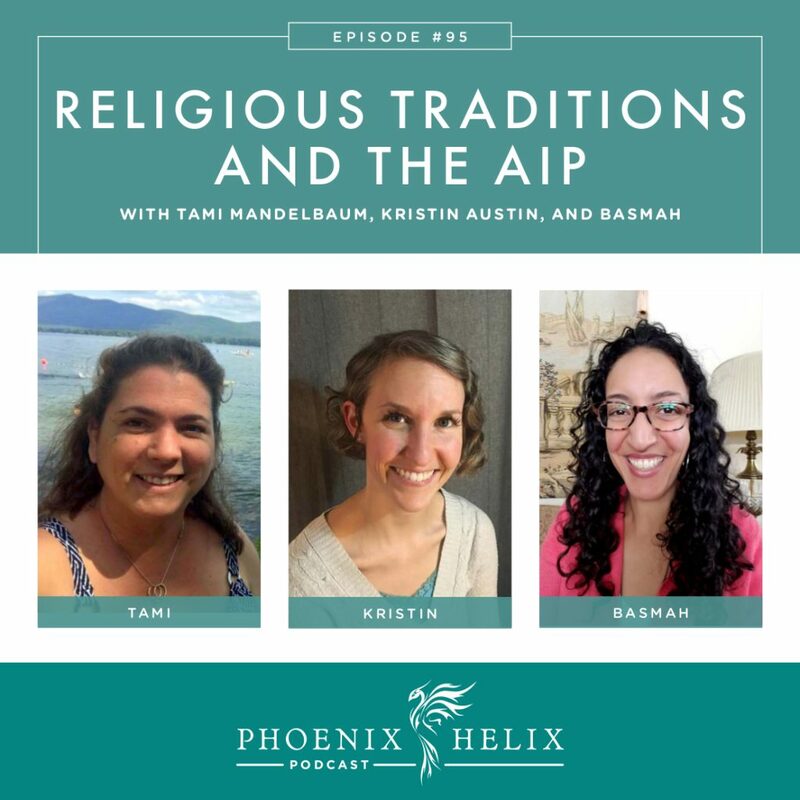 Tami's advice for people in the Jewish community who are just starting the AIP is to speak with your rabbi, rebbetzin, and other members of your community. Don't isolate yourself by avoiding synagogue celebrations. Find ways to adapt the traditional foods, and your synagogue might even help with accommodations. Even if they don't, remember that faith and celebrations aren't all about the food. Focus on what you can enjoy. 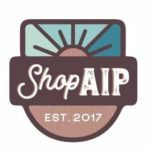 Tami is a member of three AIP groups on Facebook: Kosher AIP, Autoimmune Paleo Recipes and AIP Support. She frequently posts photos of her AIP-friendly creations for Jewish traditions and holy days. Type “Tamidan” into the group search box to find her posts. Kristin Austin is Presbyterian pastor and a Hospice chaplain. While she doesn't have an autoimmune diagnosis, she experienced chronic headaches and joint pain for years, and when she learned she had the genetic markers for rheumatoid arthritis, she turned to the AIP in 2016 to reduce inflammation and optimize her health. The tradition she found hardest to adapt is Communion/Eucharist. Bread and wine are traditionally served. Depending on the church, some Christian congregations offer gluten-free options for their members, or allow members to bring in their own dietary substitution. In the Catholic church, it is a requirement for the communion wafers to contain some wheat. Low-gluten wafers are available by special order, but gluten-free wafers aren't allowed. However, there is an option to take “Spiritual Communion” instead, which is a prayer that welcomes the blessing of the sacrament without the food. Kristin's Presbyterian church is very accommodating, but it's been a difficult transition for her anyway. Communion is a sacred part of her personal faith, and it's hard to make peace with a substitute. However, she does want to share the communion table, so she is considering bringing plantain chips as an AIP-friendly substitute. Food is also a part of many Christian church events – everything from holidays to church dinners. At first, Kristin tried eating at home and simply sitting at the table, but people noticed and felt badly that she wasn't eating. Now, she brings her own food and shares the table. It can still be awkward. Eileen shared some great advice from her friend Angie Alt: The more comfortable we are with our diet, the more comfortable others become. People pick up on our emotions. Kristin is finding it easier, and many people have commented that her food looks delicious. She has also developed a short “elevator speech” about her dietary choices that provides just enough information without overwhelming people. The people who are interested will ask more questions, and the ones who aren't will change the topic. Sharing food at the table (even when we bring our own food) is another type of communion – connecting with our community. Prayer is an important part of Kristin's life as well. During times of stress, she loves to do “breath prayers” – breathing in grace for herself and others, and breathing out shame and perfectionism. In doing this, she feels God's grace and a connection to the Holy Spirit. It's a beautiful practice in self-compassion. Kristin's advice for people who are Christian and just starting the AIP is to: (1) Be gentle with yourself. (2) Develop an “elevator speech” and practice it until you're comfortable. (3) Reach out to your priest or pastor and explain your situation. Ask for their help in finding a way to continue to receive communion in a way that fits your medical dietary needs, as well as participate in other church events. Kristin is a member of the Facebook group, AIP Support. Basmah manages Crohn's disease with the help of the paleo autoimmune protocol. She had her first Crohn's symptoms in 2003 and began the AIP in 2016. The tradition she found hardest to adapt is the holy month of Ramadan, when Muslims abstain from eating and drinking from dawn to sunset. The Islamic calendar is lunar, so the month of Ramadan changes every year. The fasting period during a summer Ramadan is much longer than a winter Ramadan. The tradition is to rise before dawn and eat Suhoor, which usually consists of fava beans, falafel and eggs, none of which are allowed on the AIP. However, it's also common to eat cereal and coffee instead, so it's accepted to adapt the morning meal. (Resource: 85 Amazing AIP Breakfasts.) Iftar is the traditional meal for breaking the fast at sunset, and the first foods consumed are usually milk and dates. The AIP version would be coconut milk or tigernut milk and dates. Following that is a communal potluck, and most of the foods served are non-AIP. Basmah usually brings her own food to these occasions, but in her culture it can be considered rude to decline the food that's offered. Her aunts and uncles were offended at first, but as her family saw her symptoms improve, they became more supportive of her healing diet. She even has a few friends who started preparing foods she can eat. Another challenge for Basmah was that she didn't know how to cook when she first went AIP. Now, her skills have improved and one of her favorite AIP recipes is koftas. The final challenge for Basmah has been the fasting itself. It triggers her Crohn's disease symptoms as well as unhealthy weight loss, so she hasn't fasted for several years now. There are exceptions to the fasting tradition for young children, the elderly, women who are menstruating, and people who are ill. But she misses the spirituality of that practice: developing compassion and empathy for those who are hungry. So, she focuses on other spiritual practices during Ramadan: prayer, charitable endeavors, reading the Koran, and practicing gratitude. The two major holidays in Islam are: (1) Eid al-Fitr (Festival of Breaking the Fast which signals the end of Ramadan). (2) Eid al-Adha (Festival of the Sacrifice). Basmah attends the celebrations, enjoying the tea that's served and bringing her own food to the gathering. Her focus is on community, faith and the meaning of each holiday. Basmah's advice for people who are Muslim and just starting the AIP is to: (1) Be kind to yourself. Remember that having an autoimmune disease is not your fault. (2) The AIP is an excellent tool for managing autoimmune disease. (3) The AIP and the Muslim faith go very well together. Each can enhance the other. You can follow Basmah on Instagram @thisimmunelife. There are many religions around the world, and we only discussed three here today. I also know many listeners aren't religious at all. Even so, I believe we all have more in common than not. We each need to navigate how changing our diet impacts our family and cultural traditions. I hope this conversation contains pieces that resonate with listeners all across the spectrum.